In case of monochrome and 8-bit images, the numColors() and colorTable() functions provide information about the color components used to store the image data: The colorTable() function returns the image's entire color table. To obtain a single entry, use the pixelIndex() function to retrieve the pixel index for a given pair of coordinates, then use the color() function to retrieve the color. Note that if you create an 8-bit image manually, you have to set a valid color table on the image as well. The format(), bytesPerLine(), and numBytes() functions provide low-level information about the data stored in the image. Each pixel stored in a QImage is represented by an integer. The size of the integer varies depending on the format. QImage supports several image formats described by the Format enum. The monochrome (1-bit), 8-bit and 32-bit images are available in all versions of Qt. In addition Qt for Embedded Linux also supports 2-bit, 4-bit, and 16-bit images. For more information about the Qt Extended specific formats, see the documentation of the Format enum. The mirrored() function returns a mirror of the image in the desired direction, the scaled() returns a copy of the image scaled to a rectangle of the desired measures, the rgbSwapped() function constructs a BGR image from a RGB image, and the alphaChannel() function constructs an image from this image's alpha channel. setAlphaChannel() Sets the alpha channel of the image. setNumColors() Resizes the color table. Only monochrome and 8-bit formats. If format is an indexed color format, the image color table is initially empty and must be sufficiently expanded with setNumColors() or setColorTable() before the image is used. Returns the alpha channel of the image as a new grayscale QImage in which each pixel's red, green, and blue values are given the alpha value of the original image. The color depth of the returned image is 8-bit. You can see an example of use of this function in QPixmap's alphaChannel(), which works in the same way as this function on QPixmaps. See also setAlphaChannel(), hasAlphaChannel(), Pixmap, and Image Transformations. See also scanLine() and numBytes(). This is equivalent to numBytes()/ height(). 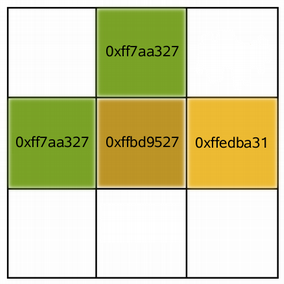 See also setColorTable(), numColors(), and color(). The supported depths are 1, 8, 16 and 32. Constructs a QImage from the first size bytes of the given binary data. The loader attempts to read the image using the specified format. If format is not specified (which is the default), the loader probes the file for a header to guess the file format. See also alphaChannel() and Image Information. Notice that numColors() returns 0 for 32-bpp images because these images do not use color tables, but instead encode pixel values as ARGB quadruplets. See also setNumColors() and Image Information. Sets the alpha channel of this image to the given alphaChannel. If alphaChannel is an 8 bit grayscale image, the intensity values are written into this buffer directly. Otherwise, alphaChannel is converted to 32 bit and the intensity of the RGB pixel values is used. Note that the image will be converted to the Format_ARGB32_Premultiplied format if the function succeeds. See also alphaChannel(), Image Transformations, and Image Formats. If index is outside the current size of the color table, it is expanded with setNumColors(). 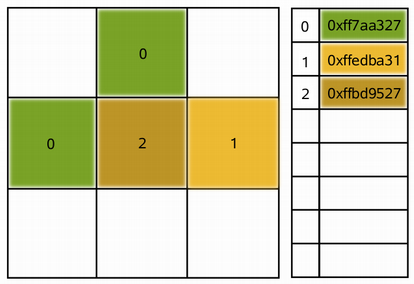 See also color(), numColors(), setColorTable(), and Pixel Manipulation. Together with dotsPerMeterY(), this number defines the intended scale and aspect ratio of the image. Together with dotsPerMeterX(), this number defines the intended scale and aspect ratio of the image. Resizes the color table to contain numColors entries. See also numColors(), colorTable(), setColor(), and Image Transformations. Sets the the number of pixels by which the image is intended to be offset by when positioning relative to other images, to offset. If position is not a valid coordinate pair in the image, or if index_or_rgb >= numColors() in the case of monochrome and 8-bit images, the result is undefined.